It is almost Memorial Day, that special time when Americans pause to honor soldiers who died in military service. 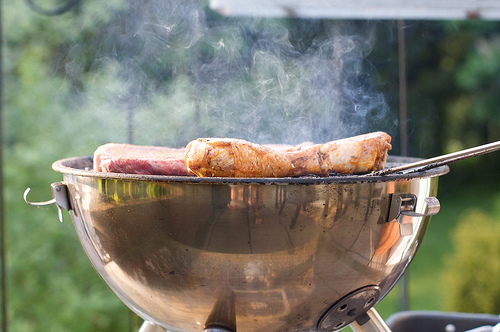 It is also traditionally the long weekend that represents an unofficial start of the summer. Many will visit newly opened community pools and spark up the barbecue for the first time of the year. I often tell my "Introduction to the Social Sciences" students you can study virtually anything! Even Memorial Day. Need to know how many Catholics have served in the military or reserves (formerly or on current active duty)? Simple. There’s a poll for that. More than 8.5 million self-identified Catholics in the United States or currently serving overseas report that they are or were in the military or reserves at some point in their life. Overall, 47% of self-identified Catholics have either served themselves or have a close family member or other relative who has served in the military. 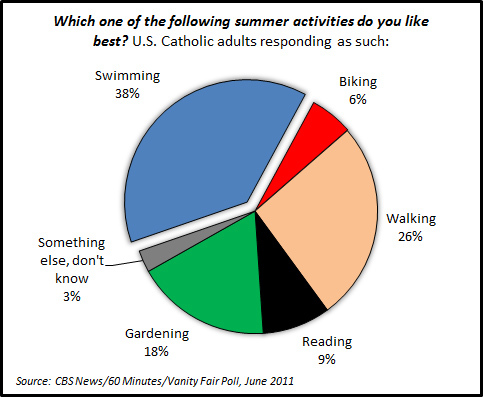 On to something a bit more lighthearted... What do Catholics think about summer? They love it. 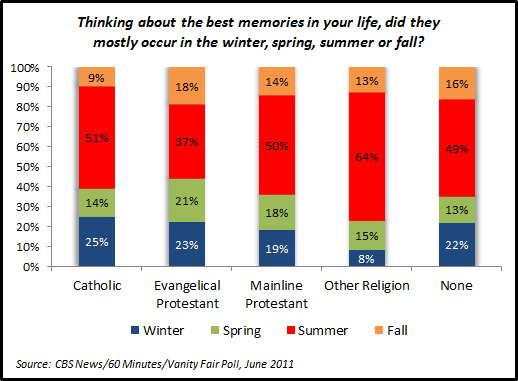 Like those of other faiths, Catholics are most likely to pick (about half or more) summer as the season where most of their best memories reside. Only Evangelical Protestants stand out from the crowd with disproportionate numbers choosing spring and fall. Catholics are remarkable in that fewer than one in ten cite autumn as a favorite (i.e., my personal choice… What’s not to like about football, falling leaves, All Hallows Eve, new school supplies, and October Mass attendance headcounts?). So what’s on the menu this weekend? Beef. 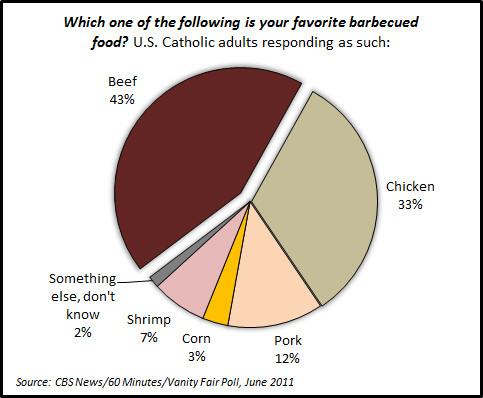 If you are dining with Catholics expect steaks, hamburgers, or beef ribs. This is another area where Catholics stand out among the faith crowd. No other group loves beef this much with the Nones—those without a religious affiliation—shunning it the most at a paltry 30% preference rate. If you are planning on dining with Evangelicals this weekend expect to eat chicken (…their most preferred pick at 37%). What will Catholics do after resting the required one hour after lunch or supper to prevent cramping? They’ll likely swim (…nearly four in ten). One in four will walk and nearly one in five will garden. Biking and reading may consume some of the time. Expect to see Mainline Protestants and Nones at the pool as they are even more enthusiastic about swimming (44% and 47%, respectively). Nones may be the most likely to wear inappropriate swimwear (I don’t have any polling data for this… it’s just a hypothesis). Watch out for Evangelicals on the bike paths (12% preference rate). If you need to borrow some gardening supplies talk to those affiliated with a non-Christian faith (22% prefer gardening). In the same survey, a majority of people who say they go to the beach in each faith group report that they "always" wear sunscreen (53% of Catholics). The only exception here is with those affiliated with a non-Christian faith. Only 47% of this group indicates consistent sunscreen use. So on your way back from swimming at the beach or a pool if you happen to run into a neighbor of a non-Christian faith that is out gardening offer them some sunscreen. Everyone hates skin cancer. We should see nearly four in ten Catholics attending Mass on Pentecost Sunday. With many traveling this weekend they may need MassTimes to find a parish. So expect to see some out-of-towners in the pews if you live in a resort area. Above photo courtesy of Gepat at Flickr Creative Commons. 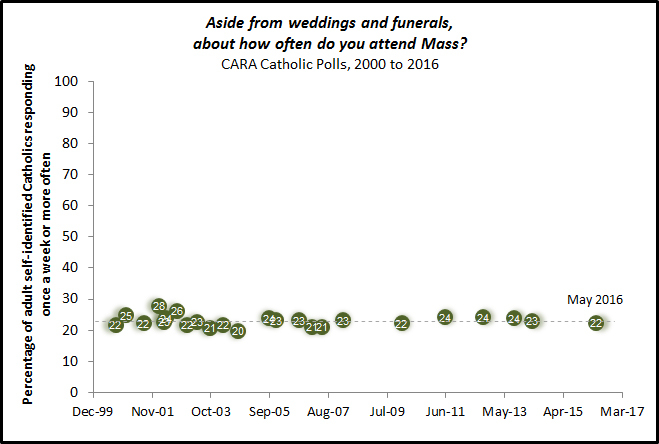 With the recent release of ASARB data on the size of U.S. religious group memberships and our previous post on this topic I began to think about the multiple ways in which one could think about the "number of Catholics." I am preparing for a presentation next week for an Ave Maria Press webinar (you can sign up here) on the Emerging Models of Pastoral Leadership project. We are looking at a very specific sub-group of Catholics—parish leaders. We define this in the project as all of those on staff, volunteers, council members, and highly active parishioners. The presentation will include results from a national survey of parish leaders regarding their evaluations of their parish and their ministries, as well as their descriptions of how they were called to ministry. First, let me note these estimates are generated for 2010 and are derived from multiple data sources including CARA (1, 2, 3) and Pew (1, 2). The bars are like a Russian doll with each lower bar generally being a subset of those above it (don't add the bars together!). The largest bar on the chart is the total number of people in the U.S. baptized and raised Catholic. This includes nearly 97 million people in the country today (...and remember, because of immigration some of these individuals were baptized in other countries). Of course some of these individuals no longer self-identify as Catholic and either have no religion or are affiliated with some other faith (although technically they remain baptized Catholic and could return to the Church). Of these 97 million people, nearly 75 million continue to self-identify as Catholic (approximately 24% of the U.S. population). The next group of bars covers those who are parish-connected. The number for individuals registered with a parish is based on a CARA survey of pastors in U.S. parishes for the Emerging Models project. At 58.3 million this is nearly identical to the ASARB estimate of 58.9 million Catholics adherents, which is "roughly equivalent to those who are known in some way to each parish or mission" (the difference between these counts and what dioceses report in The Official Catholic Directory, 65.4 million, is the adjustment some are making for active Catholics who are not registered. More than 6,500 U.S. parishes indicate they serve a significant number of non-registered parishioners. Most pastors indicate these parishioners are recent immigrants, Hispanics, and young adults). Some 50.6 million Catholics attended Mass at Christmas or Easter in 2010 (...some are not registered with a parish and many in this group overall attended Mass regularly as you will see below). For those readers interested in New Evangelization you now know the approximate size of three important populations. First, there are the 22.5 million people who were baptized and raised Catholic who no longer self-identify as Catholic. Second, there are the 16.2 million people who self-identify as Catholic but who are not in a household that is registered with a parish (although technically there is no requirement to register with a parish... But it is helpful!). Finally some 23.8 million self-identified Catholics (many not registered with a parish) who do not attend Mass even at Christmas or Easter. From here on Catholics who are parish-connected and who attend Mass with some regularity come into full view. Some 36.5 million Catholics attend Mass at least once a month (i.e., this total includes those who attend more frequently) and 32.8 million are in a household that gives regularly to a parish offertory collection. We must drill down further to specifically focus only on the 17.9 million Catholic weekly Mass attenders (i.e., those attending every week. This is different from the number of Catholics attending in any given week. This total is not shown on the graph and includes approximately 23.1 million individuals on a typical weekend). Now down to the question of parish leadership—the number of Catholics who say they are "very involved" with parish life other than attending Mass. 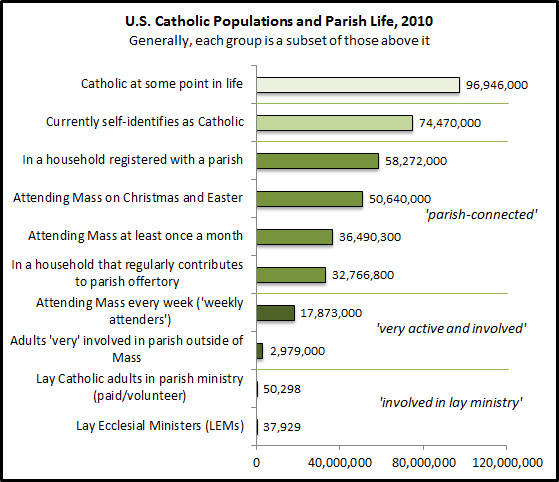 This totals just under 3 million or about 168 people per parish in the U.S. (there were 17,782 U.S. parishes in 2010). To give you a better idea of all the populations discussed above per parish see the graph below. Above photo courtesy of _Libby_ at Flickr Creative Commons. As you likely know, Health and Human Services (HHS) Secretary Kathleen Sebelius has been invited by the Georgetown Public Policy Institute (GPPI), a highly-ranked graduate program offering master’s degrees in public policy, to be one of many speakers at Georgetown’s multiple commencement awards ceremonies (she is not “the commencement speaker” for Georgetown University and she is not being given an “honorary degree”). GPPI is the same program that hosted Rep. Paul Ryan for the Whittington Lecture a few weeks ago. Outside of theology (...within theology Ex Corde Ecclesiae is the essential framework through the authority of the local bishop and Church hierarchy), I think it is acceptable and even important to have (...but not necessarily honor) speakers on campus who are approaching their fields of expertise from a variety of perspectives—especially in forums where faculty and students can exchange ideas, praise, and/or criticism (…and frankly there are Catholic politicians from both parties, including Rep. Paul and Sec. Sebelius, who could use an earful of criticism at times). I don’t think anyone becomes “less” Catholic by hearing or participating in these exchanges just as cardinals and popes have not lost their faith when atheist Stephen Hawking has presented at the Pontifical Academy of Sciences (…it is also clear that reading a lot of atheist Ayn Rand did not damage Rep. Ryan’s Catholic faith). It would be silly to think that the Catholic identity of the Vatican needs to be “strengthened” after years of Prof. Hawking explaining his physics research to the Church hierarchy just as I don’t think a single student who heard Rep. Ryan or who may hear Sec. Sebelius will become “less” Catholic by doing so. Before Rep. Ryan’s talk, 90 Georgetown faculty members signed a letter protesting his statement that Catholic social teaching had inspired his budget. I do not recall seeing letters of “outrage” from any groups outside of Georgetown even though U.S. Bishops have been clear that his budget is incompatible with Church teachings (1, 2). The Georgetown faculty members were not protesting his appearance at Georgetown and as I understand it, Sec. Sebelius has never similarly claimed that her faith inspired her policy-making at HHS (although it would be interesting to hear her try to make this case!... e.g., she is vocal supporter of abortion and has been asked by her bishop to not receive Communion). I believe that a much smaller number of Georgetown faculty members have signed a new letter critical of the Sebelius choice (I have not seen it yet). Also as I understand it, Sec. Sebelius was selected by GPPI students and not by faculty to speak at the commencement event. As a member of the Georgetown community I am in no position to tell Sec. Sebelius or Rep. Ryan how to be a “better Catholic” (that is up to their bishops). I am not a theologian and certainly have no teaching authority on matters of faith. But I am a political scientist and on the basis of likely policy outcomes alone I do have to say I personally disagree with both Rep. Ryan’s budget and many of the policies Sec. Sebelius crafted at HHS (even as I, like the U.S. Bishops, strongly support the principle of “healthcare for all”). 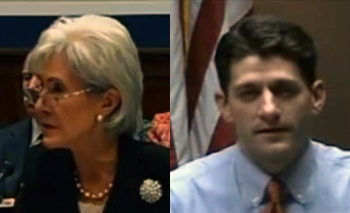 I did not oppose Rep. Ryan’s lecture appearance but I do oppose the invitation offered to Sec. Sebelius for a GPPI commencement event and would similarly not think it fitting for Rep. Ryan to speak on such an occasion. My criticisms of Sec. Sebelius are consistent with those voiced by a Georgetown faculty member at GPPI who has expressed serious concerns about HHS policy-making under her leadership (he also signed the Ryan letter). In his own words, he has argued that the Obama administration “utterly botched the admittedly difficult question of how contraceptive services should be treated under the new health-care law.” This GPPI faculty member argues further that “religious pluralism imposes certain obligations on government, I think the Church’s leaders had a right to ask for broader relief from a contraception mandate that would require it to act against its own teachings. The administration should have done more to balance the competing liberty interests here.” If Sec. Sebelius indeed botched decisions as described above on the mandate (and there is reporting to indicate that she was a essential to these decisions) and failed to consider basic constitutional issues to the point where her policy could be (...some say likely to be) declared unconstitutional (arguably the worst failure a policy could face) I think it is fair to say she might be a bit out of place as a speaker during commencement week at a school of public policy! The GPPI faculty member I quoted above is of course the well-respected E.J. Dionne and these comments were part of an op-ed you can and should read here. Much has changed since Prof. Dionne wrote this piece. I don’t know him personally nor his current evaluations of the HHS mandate or its follow-up accommodation. It is very possible that his evaluations have changed. I think Sec. Sebelius, like Rep. Paul Ryan, would perhaps be an appropriate speaker for something like the Whittington Lecture in the future but her appearance on the graduation slate for public policy students in 2012 just doesn’t feel right for a variety or reasons. In my opinion, as a political scientist, she is certainly an important national policy maker (and perhaps that is the selection standard being used)—just not an exceptionally good one so far. I think it is the responsibility of faculty to only hold up excellent examples of the professions we prepare students for at their graduations. The matter of whether she is someone who should be speaking at a Catholic university commencement event given matters of faith (e.g., her stance on abortion) is for others to decide (I am not an administrator) and sadly that very debate has taken the focus entirely off of what Georgetown’s commencement should be about—the students (including the vast majority who are not a part of GPPI). Georgetown was able to put clock hands back on Healy Hall. I wish there was a way to also “fix” what feels kind of like a “senior prank” by the 2012 graduates of GPPI. Even if she was the students’ desired pick, again as a political scientist, I think the students deserve a better example of policy-making as the last speaker they will hear on campus. 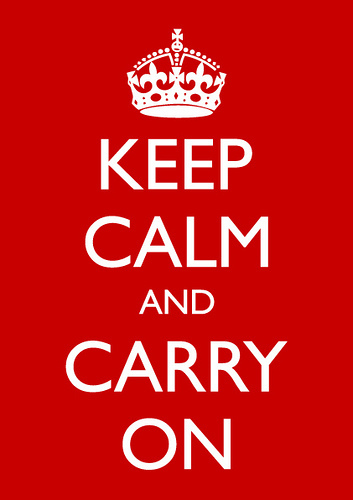 As I sat at my desk Tuesday, I felt a great disturbance in my Twitter feed as if tens of thousands of Catholics had suddenly left the faith. The cries of both liberal and conservative Catholic bloggers rang out demanding their bishops act to stem the tide of the mass exodus (“Latin Masses only, ordain women, stop giving sanctuary to immigrants, the death penalty is not that bad, is celibacy really necessary?, be nice to Paul Ryan”… it’s like a match game you figure out who would likely be calling for what). Confusion… did the Catholic Church really get smaller in the last decade? If you believe that I have a wager I’d like to discuss with you! We’ve gone over this topic before. To really understand what is going on some clarification on definitions needs to be made. The ASARB data counts “adherents” and although it is referred to as a census it really isn’t in the traditional sense. Do you remember filling out your form? No you don’t because the adherents counted in the study are reported by the religious groups studied. A Catholic adherent “is roughly equivalent to those who are known in some way to each parish or mission.” The ASARB study considers the remainder of individuals in any county (as measured by U.S. Census totals), not counted by a religious group, to be “unclaimed.” Many of these people are religious and some are Catholic—the Church is just unaware of their presence. They may attend Mass only occasionally and are likely not registered with a parish. Does this make them non-Catholic? No (and they have not “ex-communicated” themselves either!). In fact these people still self-identify as Catholic and do many Catholic things. The ASRAB study basically measures church-connected membership. This is not the definition used by the Catholic Church or social scientists more broadly. For the Church, being Catholic is defined by baptism. For social scientists we consider self-identification to be the base definition. With that said there is a lot of consistency between numbers reported in the The Official Catholic Directory (OCD) and ASARB. Why? Because the Church provides both estimates based on what they know using parish registration numbers, October Mass attendance head counts, giving to Church collections, sacramental numbers, etc. The OCD and ASARB only differ by an average of 2.4% within states. Why are ASARB’s numbers lower overall? ASARB’s 2010 estimates for Catholics in Georgia and Texas are potentially problematic. ASARB estimates there were 596,384 Catholic adherents in Georgia and 4,673,500 in Texas. By comparison the OCD estimated 977,287 in Georgia and 6,896,051 in Texas. A majority of the disparity between the two national estimates for 2010 is based on different estimates for these two states. What numbers would I go with? Not ASARB’s. 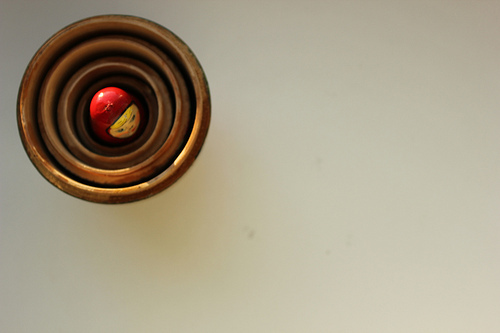 Surveys using self-identification indicate the Church’s estimates in the OCD were (and continue to be) closer to the reality for Church-connected Catholics. Is it possible that the number of Church-affiliated Catholics declined from 2000 to 2010? Not if the measure being used is Mass attendance. The rate at which Catholics attend has remained unchanged as the number of self-identified Catholics in the U.S. grew by 8%. However, it is the case that parish registration has dropped be about 8 percentage points in the last decade. So if the Church is reporting Catholic numbers from registration rolls alone then technically a drop in adherents is possible but unlikely (…and using registration is neither a valid or accurate measurement of activity!). 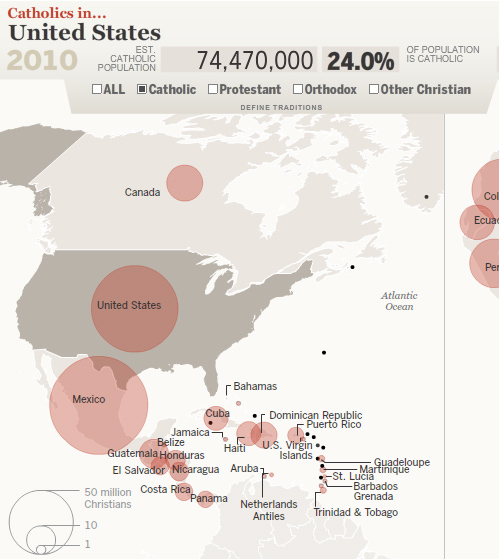 So just how many Catholics are there in the United States? Currently there are about 77 million and in 2010 it was estimated to be nearly 75 million. Think I’m just being too optimistic? Here are Pew’s recent estimates for 2010 based on self-identification in surveys and census data. The Catholic population has been about 23% to 25% of the total U.S. population since the end of World War II and is expected to continue to account for this much of the population or perhaps even a bit more in the future. As the population grows, so do the total number of Catholics. I don’t know of any serious social scientist (who cared about their reputation) that would argue that the number of self-identified Catholics in the U.S. declined in the last decade (...even as immigration of many Catholics from Mexico may have shifted negative and the Church has welcomed some “reverts”). It may be possible that the number of Church-connected (registered, weekly attending) Catholics declined, but I again I wouldn’t bet on it. 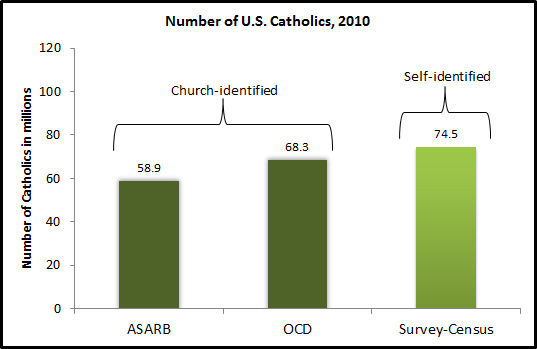 The Church counts from the OCD and ASARB tend to underestimate the self-identified Catholic population by an average of 26%. There are two recent diocesan examples where I can specifically demonstrate the effects of relying on Church-connected counts. In Albany, CARA recently conducted a telephone survey of more than 3,500 randomly selected adults in the Diocese. Of these 34% self-identified their religion as Catholic. Extrapolating to the population this means there were more than 475,000 Catholics in the Diocese of Albany even as only 334,055 are reported in the OCD and 346,013 are estimated using the ASARB data for 2010. The Diocese of Camden recently commissioned a telephone survey (regrettably not with CARA!). This survey is a bit more unreliable as it only includes 612 randomly selected adults of which 34% self-identified as Catholic (...thus it likely has just over 200 Catholic respondents resulting in a margin of error of +/-6.8 percentage points for this sub-group). Extrapolating from this survey, one would estimate there to be about 474,000 Catholics in the Diocese which is similar to the OCD number of 505,504. But ASARB only estimates there to have been 387,872 Catholic adherents in Camden in 2010. It's not that Church-connected counts are “wrong.” They simply measure something other than the total number of Catholics. 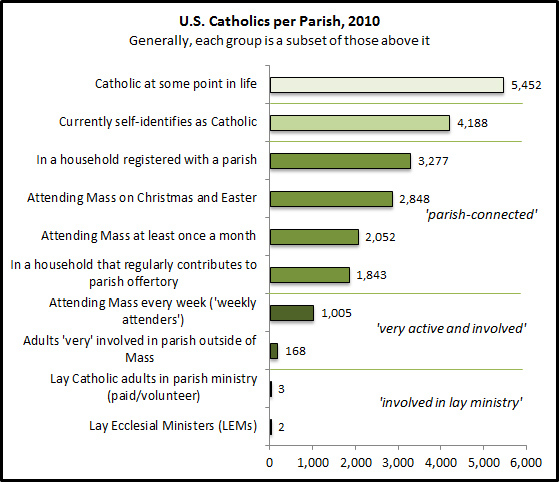 Instead, these estimate only active (regular attending) and parish-connected (registered) Catholics. In fact, when these counts are used in conjunction with the self-identified Catholic estimates provided by surveys one has a very good understanding of the numbers that might be a target for New Evangelization and outreach.